WILLS POINT, TX – Gospel for Asia (GFA) Special Report – Discussing the impact of education on the eradication of extreme poverty. The father who works from sunup to sundown seven days a week will have little time to mentor his children. The same could be said of the mother who labors in the fields all day. During their most formative and vulnerable years, millions of children are left alone during the day to wander in their villages. Many will adopt poor social habits and learn nothing of respect or self-discipline. School is out of the picture for them; all the family’s energy must be focused on providing food and shelter. God’s creation of the human mind is a marvelous thing. It has the capacity to imagine, dream, create, cherish, remember, deduce, learn and use logic. When given opportunities through education to learn, cultivate skills and dream, we are capable of accomplishing extraordinary things. To name a few, these include sending human beings into space, discovering medical breakthroughs, crafting new written languages and rebuilding crumbled economies. We’ve glimpsed snapshots of what happens when mankind lacks the necessary opportunities to cultivate the amazing mind God has granted him. Underdeveloped minds and absent opportunities steal much of the influence people could make if they only had a chance. Underdeveloped minds and absent opportunities steal much of the influence people could make if they only had a chance. What does it look like when people with little or no opportunity to receive an education are at last given that chance? The impact of education on children, families and entire communities affected by poverty is vast and multi-faceted. Let’s consider just a few of the most prominent outcomes of education. The strong connection between education and income is easy to identify. For every year of primary education received as a child, a worker’s earnings experience a 10 percent increase. Knowledge of a skill empowers breadwinners to find jobs with better pay and better hours. A literate person in Pakistan earns 23 percent more than an illiterate worker. And in the female workforce, a woman with high literacy skills can earn 95 percent more than an illiterate woman or one who has low literacy skills. In rural Indonesia, those who finish lower secondary education are twice as likely to escape poverty. In addition, their chances of descending into poverty are reduced by a quarter. Increased education doesn’t only open new job opportunities for breadwinners; it also enables workers to succeed in their inherited family businesses. Farmers who receive an education are more likely to implement the use of fertilizers and be better equipped to understand the needs of their crops and soil. Equipped with mathematical skills, a parent can wisely make choices on purchases, contracts and family budgets. And in any business, an increased understanding of finances and mathematics helps guard business owners against being taken advantage of. more likely to live past the age of 5. The increase in pay a literate person receives also increases their chance for a healthier life. The extra income buys food for children who might otherwise suffer from malnutrition; it gives the family the option of visiting a doctor for medical treatment—and even better, it enables them to undergo preventative medical care such as regular checkups or vaccinations. A healthy breadwinner misses fewer days of work than a sickly one, and medical bills demand less from the family budget. But education’s impact on a family’s health extends beyond their improved financial situation. By learning how to wash his hands, this young student in GFA’s Bridge of Hope Program helps his family to be more healthy. Education also empowers parents to make wise, healthy choices for their families. If a mother can read, her child is 50 percent more likely to live past the age of 5. The mother is able to read warning labels and follow those simple instructions intended to protect her family from diseases or accidents. In places where education is absent, superstitions abound. Misconceptions on proper health practices endanger grown adults and children alike—especially children in the womb. In the case of one mother in Asia, her lack of education tragically resulted in her child perishing before birth. Sadly, her story is repeated in villages across the globe. Simple health care classes for women who never received education can mean the difference between lost pregnancies and healthy, full-term babies. One of the most common hygiene practices—hand washing—is virtually unknown in some parts of the world. According to UNICEF, “Rates of handwashing around the world are low. Observed rates of handwashing with soap at critical moments—i.e., before handling food and after using the toilet—range from zero percent to 34 percent.” As a result, easily avoided illnesses are claiming millions of lives. Every year, diarrhea claims the lives of more than 1.5 million children under the age of 5; proper handwashing practices can reduce diarrhea by more than 40 percent. A person’s health impacts their education as well: A study among primary schools in China with active hand-washing promotions and distributions of soap identified that students missed 54 percent fewer days of school compared to students whose schools had no such program. There is power in education. “No country can really develop unless its citizens are educated,” said Nelson Mandela. Education inspires dreams and equips citizens to pursue their goals. The resulting entrepreneurial efforts help boost economies and create jobs, which aids in global efforts to eliminate poverty. Literacy is also key to being informed about what is taking place around the world. It builds global awareness into a person’s heart and enables them to engage with others in ways that are impossible without literacy. The UN states that “quality early education provides children with basic cognitive and language skills and fosters emotional development.” Alternatively, an estimated US$129 billion is lost each year due to the 250 million children globally who are not learning basic skills (and thus have less potential). The importance of quality education on society is revealed by its inclusion in the UN’s global Sustainable Development Goals. Beyond influencing the economy of a society, education also touches the fibers of morals and lifestyles in a region. According to Professor W. Steven Barnett, author of Preschool Education and Its Lasting Effects: Research and Policy Implications, a child’s academic success can be impacted by early childhood education, which can also reduce incidences of crime and delinquency. The National Scientific Council on the Developing Child confirms that a person’s childhood heavily influences their mental, physical and emotional development, with children raised in secure, loving environments thriving more than children who have experienced trauma even one time. Do you remember the joy you felt as a child when you did something well in school? The sense of accomplishment and the praise from a teacher or parent give courage and confidence to approach other challenges in life. In the same way, the shame felt when encountering failure can hinder children in life. If a child grows up with a constant sense of failure and insufficiency, that can result in low self-esteem and lack of confidence. Training children at an early age to pursue their goals and giving them the tools they need to succeed prepare them to thrive in the future challenges they will face as adults. More than 250 million women in Asia are illiterate. The women pictured learned how to read for the first time through Gospel for Asia supported literacy programs. Remember hardworking Dayita and her roaming children? Their story also serves as an example of the powerful gift of education. One day, some staff members from a local Gospel for Asia-supported Bridge of Hope center met Dayita and her family. Upon hearing of her struggle and seeing the condition of the family, the staff members offered Dayita’s 7-year-old daughter, Kasni, the chance of a lifetime: the opportunity to go to school. That day changed the course of Dayita and Kasni’s family: The cycle of poverty and illiteracy began to break. Dayita’s 7-year-old daughter Kasni is now enrolled in a GFA-supported Bridge of Hope center and is learning skills that will enable her to leave the cycle of poverty behind. At the Bridge of Hope center, Kasni began learning skills that will empower her to escape poverty, subjects such as arithmetic, science, language skill and history. She also had opportunities to learn about art, dance, respect and self-discipline. She thrived in her new environment, and her joy spread to her family. Dayita had never dreamed she would be able to send her daughter to school, yet now her little Kasni was developing and growing into a bright young student. Kasni’s future would hold more hope than her own had held at age 7, and hopefully Kasni would be spared from many of the trials Dayita had experienced from her illiteracy. The Bridge of Hope center impacted the family in additional ways, too. Kasni received a nutritious meal every school day, which helped ease the financial burden of the family. She and the other Bridge of Hope students participated in health awareness programs and medical checkups, and all their books and school supplies were provided by the center. In addition, special programs were held regularly to help cultivate students’ social skills and character. Kasni continued to care for her younger siblings for a portion of the day, and with her new skills of respect and responsibility, she was better equipped in her role as an elder sister. Many of the things Kasni learned through the center benefited her mother as well. Special programs for the parents helped Dayita grow in knowledge, too. Kasni is just one among 75,000 children enrolled in GFA’s Bridge of Hope Program. Through Bridge of Hope, these children and their families are finding a new way of life—a life that leads to hope and a door out of poverty. Teachers at GFA-supported Bridge of Hope centers teach with love and care, which helps the children enjoy class and excel in their studies. Overwhelming evidence of education’s effectiveness in reducing poverty has prompted massive efforts around the world to make quality education available to everyone—especially to the poor. These efforts range from large-scale endeavors like those of UNICEF and Global Partnership for Education, to family-run schools and volunteer-led tutoring. Although the groups are different in size, they have one significant component in common: people who are doing what they can to help the needy children in their sphere. 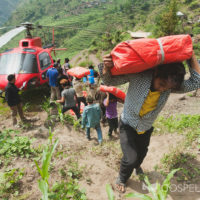 Gospel for Asia (GFA) is just one of those players, yet God is using this one organization to impact thousands of lives. GFA’s Bridge of Hope Program began in 2004 and was designed to help transform the lives of children who live in poverty. Recognizing the broad reach poverty has on families and children, Bridge of Hope takes a holistic approach to education, investing in the minds, emotions and bodies of the students. Food, clothing, encouragement, medical care and times of childhood fun all work together to build into the students’ lives and prepare them to be valuable citizens in their countries. Stories abound of the transformations taking place in these little children—children who are growing up to be well-equipped adults who know they have value and potential. Children who were painfully shy or woefully behind in their studies when they started at Bridge of Hope later dream of becoming doctors, engineers or teachers. Others aspire to design clothing or to help poverty-stricken families climb out of poverty. Some will grow up to hold positions of great influence in their society, others will help their family farms prosper in improved ways, and still others will invest into the lives of their children the way Bridge of Hope teachers invested in their own lives. These children have learned to dream, and their education equips them to pursue those dreams, contribute to society and raise their children-to-come with the same life-changing values they have embraced. Aayush joined Bridge of Hope at 10 years old. Now a capable young man equipped with a quality education, he is pursuing his goal of becoming a teacher. As far as which comes first, poverty or lack of education, the answer isn’t clear. But the solution is clear. And when you address one issue, you also address the other. The “magnetic draw” between poverty and education doesn’t only have to pull people down; it can also give the leg up needed to escape both perpetuating cycles. Despite the magnitude of the task and the global scale at which education is needed, we’re talking about individual human lives, each one precious and full of potential. While the statistics of need can be overwhelming, we must stop and celebrate the lives that are being touched and the futures that are being transformed. Just one life changed in a village can multiply to impact hundreds of other lives. It is good to ask ourselves what our part is in these global efforts. Not everyone is meant to be the leader of a large-scale movement to bring education to the world. Some people need to be teachers; others need to be financial backers for those who are on the frontlines; and others can be advocates for quality education in their own spheres of influence. To read more on the pertinent issue of Poverty around the world on Missions Box, go here. Schools & Health. The Impact of Education. June 2018. Pencils of Promise. The Issue. June 2018. Borgen Magazine. The Positive Effects of Education. August 11, 2014. GFA. Learning How to Save Her Baby. November 2016. UNICEF India. Fast Facts and Figures About Handwashing. June 2018. UN. Sustainable Development Goals. June 2018. Livestrong. How Education Affects Early Childhood Development. June 13, 2017. This entry was posted in Essays and tagged Bridge of Hope, children, education, illiteracy, impoverished, News, poor, Poverty, poverty line. Bookmark the permalink.